Chances are you’re already aware that non-medical home care is growing in popularity as a way to help older adults age in place – over the long term – while maintaining their quality of life. But you may not know that home care can also provide short-term assistance for adults ages 18 and older who need temporary companionship or support with the activities of daily living. One of the most frequently asked questions to our Just Ask FirstLight service is whether non-medical home care can be provided on a short-term, episodic or as-needed basis. And the answer is a resounding yes! You don’t have to commit to a long-term relationship to take advantage of the benefits of non-medical home care. A limited home care engagement can last anywhere from a few weeks to a few months, and care delivery can be scheduled around the clock or for as little as the time it takes to complete a few defined tasks – and every increment in between. 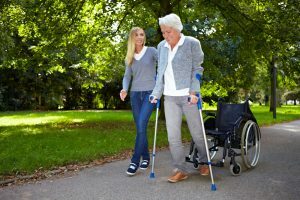 When short-term home care is related to recuperation after a hospital stay, it can have an added benefit – the reduction of hospital readmissions. For FirstLight Home Care clients, our Readmission Rescue Program is a value-add service that’s part of non-medical home care packages. The program helps reduce hospital readmission rates by putting trained certified nursing assistants (CNAs) on the lookout for symptoms or other indications that a client who’s recovering may have a health problem related to a recent hospital stay. Through detailed monitoring, reporting and appropriate physician intervention, issues can be addressed proactively to ensure clients get the care they need – before their condition forces another hospital stay. Another short-term option that’s designed to provide support specifically to family caregivers is Respite Care. Such services allow caregivers to step out of their daily support roles to take time to relax, reflect and refresh. Professional caregivers can assist loved ones – for a couple of hours, an entire day or even overnight. FirstLight Home Care services were designed to be flexible to the unique needs of the individual and the family caregiver. If you need short-term assistance to navigate an illness, injury, recovery, transition or any other life event, find a location today to learn more.